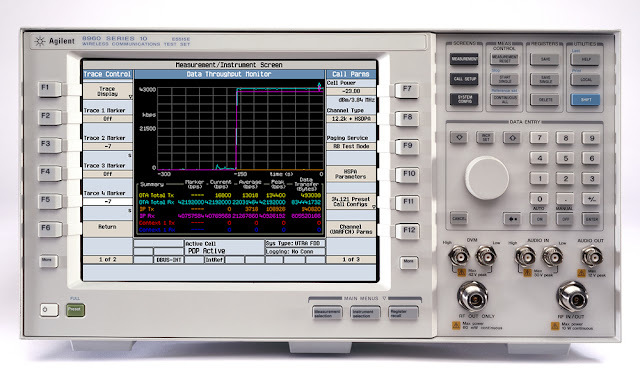 Agilent Technologies Inc. (NYSE: A) recently announced the new E6703H W-CDMA/HSPA lab application that includes support for 42-Mbps DC-HSDPA test modes and IP data connections. The application uses the recently introduced high-performance E5515E 8960 Series 10 wireless communications test set. Agilent's DC-HSDPA solution will be demonstrated at Mobile World Congress (Hall 1, Stand A46) in Barcelona, Feb. 27- March 1 . The Agilent E5515E delivers sustained, end-to-end IP data throughput at 42 Mbps, flexible and comprehensive RF measurements, and improved hardware capability for future requirements, making it easy and fast to stress wireless devices and verify their performance at full data rates. The E5515E also enables LTE developers to extensively test the performance of their device's LTE-to-2G/3G handover, when used in conjunction with the Agilent E6621A PXT wireless test set. "The dual-carrier approach to transporting high-speed IP data is helping to bridge the gap between the widely available 3G and 3.5G networks and full LTE deployment," said Joe DePond, vice president and general manager of the Mobile Broadband Operation at Agilent. "The 8960 continues to provide comprehensive and reliable 2G/3G and 3.5G performance for RF and functional tests, including dual-carrier HSDPA tests for both RF and IP data at the full 42 Mbps." Additional information about the Agilent E5515E 8960 wireless communications test set can be found at www.agilent.com/find/E5515E. Product photos are available at www.agilent.com/find/E5515E_images. Additional Agilent mobile communications test solutions can be found at www.agilent.com/find/LTE, www.agilent.com/find/LTE-A, www.agilent.com/find/HSPA, and www.agilent.com/find/WiMAX.